Yesterday, I wrote about how NHL playing the drums and bells/xylophone. When I was in school, I played a musical instrument also: violin. I was never that good at it, though. To play the violin, you need to draw the bow across the string while placing your fingers in just the right spots to make the correct note. Doing this once might not be hard, but shifting strings/finger positions in rapid succession to play a song gets tricky. 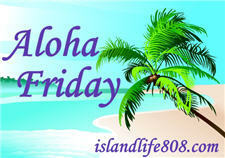 My Aloha Friday question for today is: Did you ever play an instrument? If so, were you good at it? My mother made me take piano lessons and I hated it. However, recently, I had to break down my Mom’s house, and now the piano is in my house. Just the other day, I was thinking and wishing that I could play it. I played clarinet for one year and took piano for about three years when I was young. I was pretty good at learning to play songs by memorizing them, but I was never very good at reading music. My dad played the violin, or fiddle as we called it. He loved bluegrass music and played it all of my life. He passed away a couple years ago but a few months before he died, he was able to record a CD with some of his bluegrass-playing friends to share with their families and friends. Piano and violin for me. My kids were sax players and it was wonderful! Harriet recently posted..Is Jessica’s Pink Wedding Dress a Do or a Don’t? And I’m completely okay with that ^.^ Leave the music to the more musically talented people! I played guitar. I was never very good, but continued. Then as an adult, with new-found self discipline, I got much better. Turns out that all it takes is time and energy… Who knew?